• 1912: Construction of the Hotel with the architect architect Emil Vogt. • 1913: Xmas season opening of the Carlton Hotel. • 1914 August 1: World War I is declared and makes times very difficult for the Hotel. The exiled Royal family of Greece stays at the Hotel during these years. due to economic difficulties of thoses times the Hotel becomes the property of the Volksbank of Switzerland. • 1920s: Are short golden years for the Hotel. The Hotel is managed by Mr Ernst Scherz and his wife Silvia Clara Bezzola / Mrs Scherz (father of Ernst Scherz and grandfather of Andrea Scherz, present owner of the Palace Hotel in Gstaad). • 1929 October 29: Black Thuesday the Wallstreet crash affects all the Palace Hotels of the World, times become difficult for the Carlton. • 1938: The longtime director Mr Scherz leaves to Carlton to take the management of the Palace Gstaad. • 1939 September:The Hotel Carlton closes due to World War II. • 1947: The Olympic winter season is very successful. • 1948: The Hotel Carlton closes again. • 1956: Acquisition and Reopening of the Hotel Carlton and the Kulm Hotel by Albert Ernst von Pfyffer, (owner of the Palace Hotel in Lucerne). • 1968: Grandhotels Engadinerkulm, mainly owned by Starvos Niachos buys the Kulm and the Carlton preventing a takeover of the Hotel by Club Mediterannée. • 1971: Sale to an American consortium. • 1972: Sale to Norbert Cymbalista and resale to the Banque de Paris and Pays-Bas. • 1975: Sale to an Armenian businessman who renewed the roof and the facade. 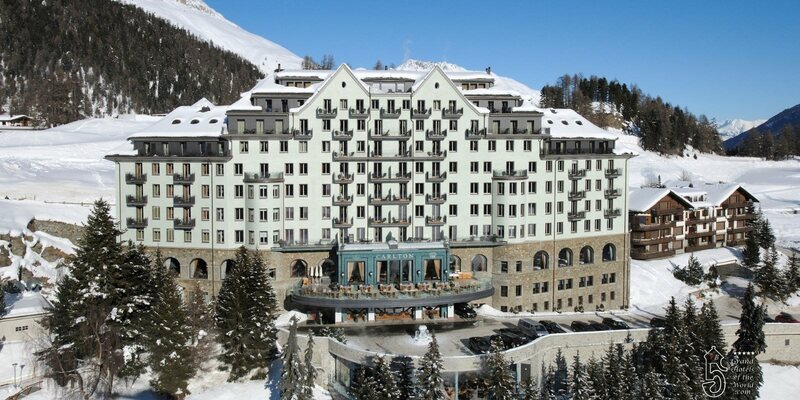 • 1980: The German supermarket tycoon Kar Heinz Kipp realizes a childhoon dream and buys a Grand Hotel, the Tschuggen Grand Hotel, in Tschuggen, Switzerland. • 1986: Mr Kipps supermarket chain Massa is introduced to the German stockmarket. • 1987: Mr Kipp retires in Switzerland and has more time for his Hotel passion. • 1988: Sale to the Carlton to Karl-Heinz Kipp, from Alzey, Germany and founder of the Massa departments stores. Kipp falls in love with the Hotel, invest significant money in a complete 18 month renovation and has the tenacity to relaunch the beautiful Hotel with it’s troubled past. • 1989: Reopening of the Carlton Hotel. • 1989: Acquisition of a sister Hotel in Ascona, the Hotel Eden Roc. • 2006-2007: Second renovation of the Carlton with the architect Carlo Rampazzi. • 2007 December: Reopening of the Carlton back to world class among the Palace Hotels of the World. the 386 m2 Carlton Penthouse suite on the top floor it is the largest suite in St. Moritz, ifnot Switzerland. • 2013: The Carlton winns the World Ski award.